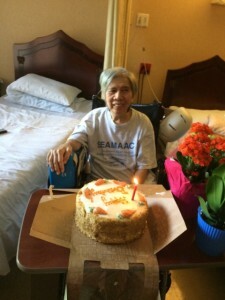 When Lan Banh came to Brookside Healthcare and Rehabilitation Center in August, she was demoralized and weak. Surgery to remove a brain tumor and a subsequent stroke had left the 63 year old unable to move the right side of her body. She needed help from nurses to even stand up. At the same time, Lan’s condition had taken an emotional toll. Exceedingly friendly and generous before her surgery, extended time in the hospital had left her depressed and uncooperative. All that changed when she began recovery at Brookside’s new, $2 million rehabilitation facility. Kiong visits his sister every day and has chronicled her transformation from a withdrawn and reluctant patient to someone who aggressively approaches her rehabilitation regimen with her eyes set on returning home and living independently. 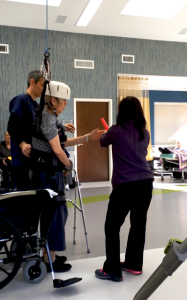 Lan is aided in her recovery by an array of state-of-the-art equipment, including a ZeroG machine – the first model installed in a subacute rehabilitation facility like Brookside. ZeroG allows Lan to engage in physical therapy and relearn walking and other activities of daily living. It is a robotic, support system mounted on an overhead track that provides body-weight support and fall protection. This allows Lan to engage in therapy in a safe fashion, building her confidence and enabling her to recover more quickly. In a few short months, Lan has regained the ability to walk short distances using the support system – progress that her doctor said would normally take a year. Utilizing the ZeroG system to assist in Lan’s recovery “was a very good idea,” Kiong said, noting a dramatic increase in her strength since arriving at Brookside. Tools like the ZeroG enable Lan to recover in a comfortable and soothing, home-like environment while receiving a level of care that previously would only have been available in a Center City hospital setting. At the same time, Lan’s therapy team is working with a leading prosthetics manufacturer to develop custom-designed supports that will eventually enable Lan to return to her Northeast Philadelphia community. Kionh said that his sister is looking forward to the time when she can get back to her friends and pick up the life she led. “I’m very happy for her because I can see the happiness she has and the hope she has,” Kiong said.